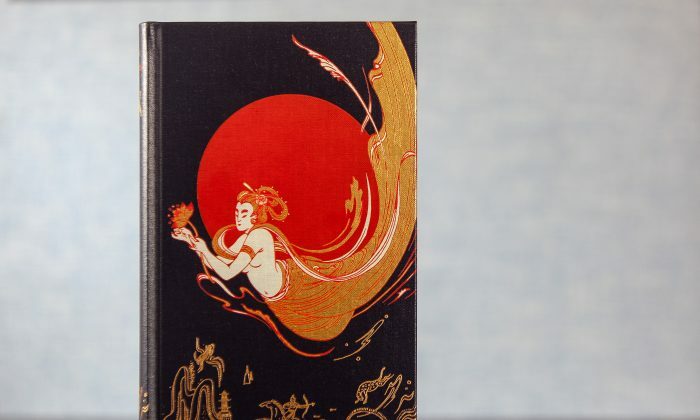 Right out of the bronze-colored slipcase of “Chinese Fairy Tales and Fantasies,” laid before the reader on the deep blue binding of the hardcover volume, are the bold strokes of a graceful heavenly deity. 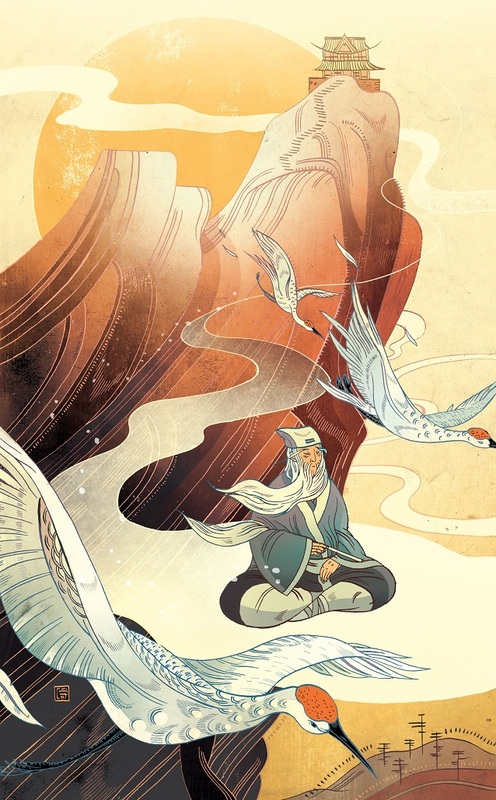 Her figure and garments wrap about the edges of a bright red sun, giving off a golden shine replicated below in an earthly scene—inviting the reader to the seldom-rendered world of China’s ancient legends. And the legends themselves, adapted by Folio from a 1979 volume translated by Moss Roberts, come from all ages of China’s rich literary history, from the parables of ancient Taoist masters living centuries before Christ to “An Unofficial History of the Confucian Academy,” written in 1750. The reader is treated to scores of underworld quests, lessons from the animal kingdom, trials of virtue and fortitude, and journeys to enlightenment. Some of the works are so famous as to be household names in the Chinese diaspora, while other, lesser-known creations do not disappoint. Many of the stories share themes with those found in the fairy tales of the West; in “A Small Favor,” a seemingly minor act of kindness is rewarded with ample fortune. Another tale, “The Family’s Fortune,” warns against foolish avarice and rash jealously. Other episodes depict run-ins with corrupt authorities and unjust rulers, in which the protagonist must pull through with only strong righteous faith in the principle that good begets fortune and that the wicked are inevitably, if not immediately, brought to justice. 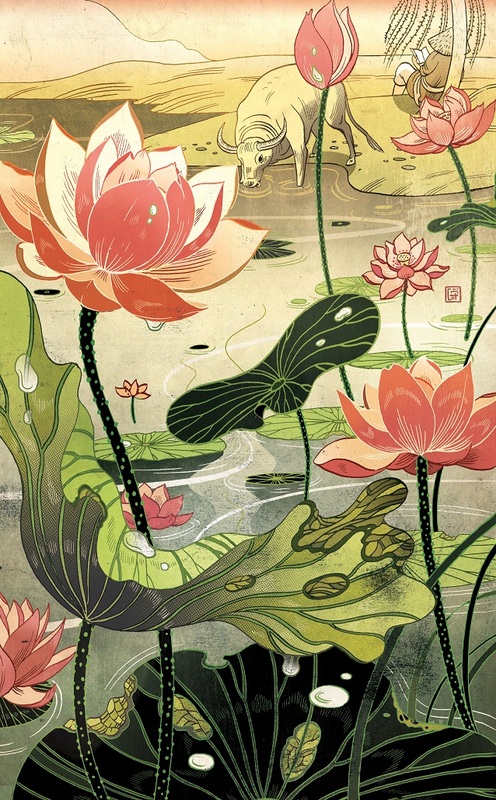 In the volume are eight full-color illustrations by Hong Kong artist Victo Ngai, whose delicate lines and otherwise concise figures are accentuated by her powerful use of color and contrast—the result is a welcome sense of dreamlike, otherworldly fascination. Contrasting abruptly with the visions encountered in the legends and fables is the preface, written by award-winning writer Yiyun Li. Raised in Beijing, her words, reflecting the contemporary materialism of the Chinese regime’s Marxist education, express a sort of uncanny bewilderment at the deep spiritual and mystical nature of the legends and folktales. What results is a clash of two identities: one Marxist, empirical, official; the other Chinese, cyclical, traditional. This Chineseness presents itself in a world of variety; the thoughts and feelings of young and old, male and female, secular and mystical, are laid out in the context of universal human experiences—adversity, elation, fear, passion—all of which are ultimately emotional tests on the road to spiritual perfection. More often than not, mystical powers feature as the teaching aids of Taoist sages rather than simple instruments for the defeat of evil or material gain. 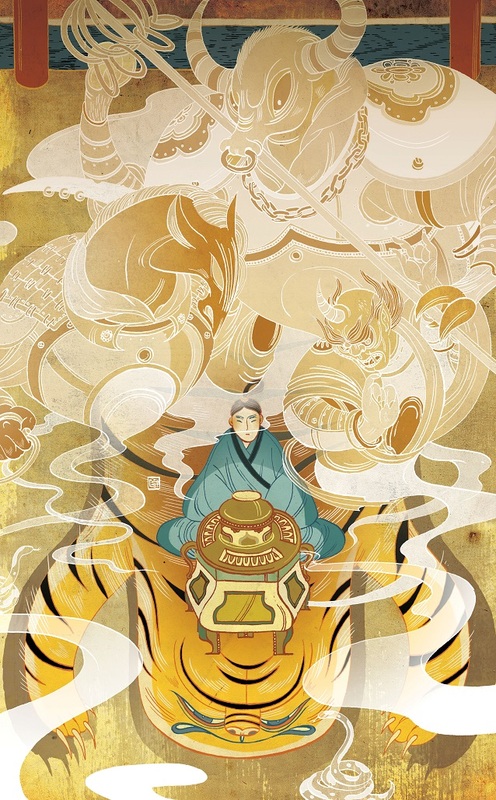 In one story, we follow a man who enters a Taoist monastery in hopes of acquiring supernatural ability. Though after seemingly pointless labors he is eventually granted mastery of some minor arts, upon returning to secular life he proves unable to contain his worldly desires and loses the ability once he uses it to show off. In “The Wizard’s Lesson,” a lazy man, tempted by the seemingly endless gifts given to him by an old master, comes to destitution multiple times through his own sloth before leaving the world to set out on the path of cultivation. The master guides him in a grueling journey through countless illusory tortures and an alternate life; yet in the end, a simple mistake denies him the opportunity to become a true immortal and he returns empty-handed to the human realm. Justice, heavenly mandate, and the Chinese belief that higher standards ultimately prevail are interwoven. In the tale “Underworld Justice,” a man sacrifices his own life in a journey to the kingdom of the netherworld on a quest to save his deceased father from the unwarranted tortures of corrupt ghouls and crooked functionaries. Enduring the full range of hellish punishment, our filial son pulls through to earn the favor of heaven. Righteous deities deliver his father from his undeserved sentence and punish both high- and low-ranking saboteurs of justice for their misdeeds. Emperor Kangxi apparently knew something about how to make the most of his time and energy. What makes a leader effective, and how to achieve the ultimate influence—legacy?